Heroines and Harridans is a tale of eccentricity (generally British), some bad behaviour (occasionally American) and rather odd love lives (some corking aristocrats). It is not by chance that the relation of matters in the past are called 'History'. It is, generally, 'his story' with many men doing grand things while the women stayed home to make the soup. 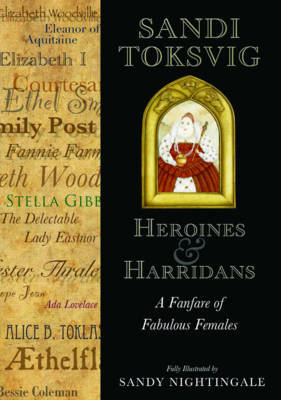 Heroines and Harridans gives another, highly entertaining view on life as comedian Sandi Toksvig brings her trademark wit and humour to bear on 22 portraits of as eccentric a melange of women throughout history as you are ever likely to find. All of the featured characters were terrific good fun, helped shape the world they lived in but in many cases disappeared into obscurity. Each of Toksvig's gloriously funny pen portraits is accompanied by equally striking and imaginative illustrations by artist Sandy Nightingale.